Colourful coral provides great camouflage for the phantasms inhabiting this ocean-themed setting. The Coral Phantasmic Oasis Skin can be used on the Phantasmic Oasis Trap. The trap's stats (power, power bonus, attraction bonus, etc.) are not changed. The Coral Phantasmic Oasis Skin can be purchased at the Sunken City Trapsmith for 240,000 gold, 130 Sand Dollars, 50 Barnacles, 50 Mouse Scales, and 50 Damaged Coral Fragments. It can be refunded at the same location for 40,000 gold. The Coral Phantasmic Oasis Skin can be traded on the Marketplace or through Give To Friends. 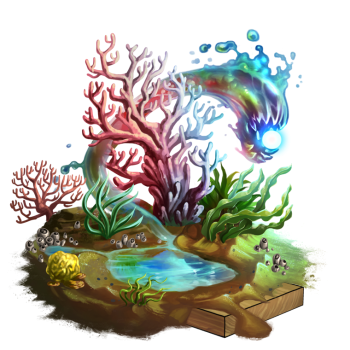 2 July 2014: The Coral Phantasmic Oasis Skin was released with the introduction of the Sunken City. This page was last edited on 9 December 2017, at 10:30.